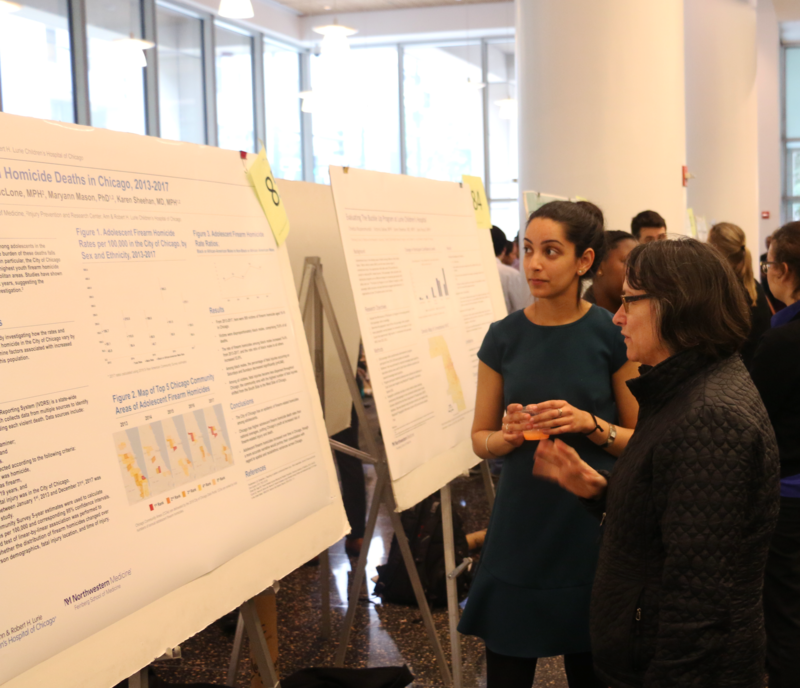 Students, faculty and mentors attend the Area of Scholarly Concentration poster session. 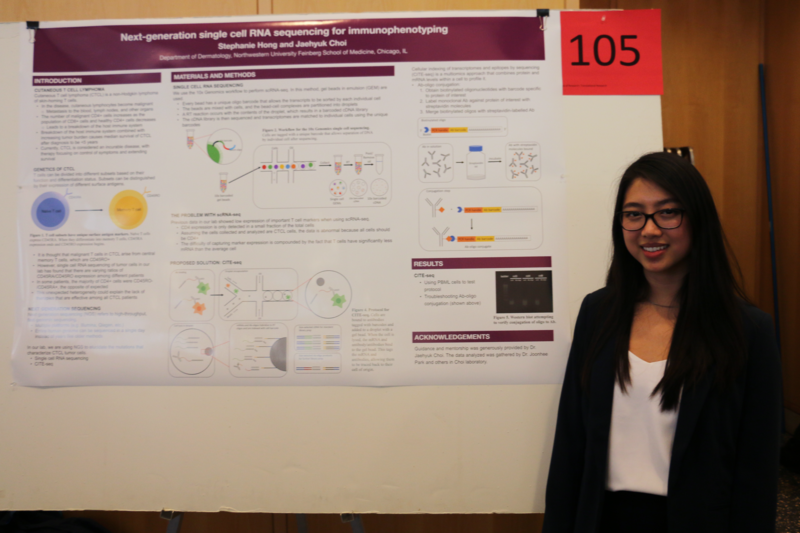 For her Area of Scholarly Concentration (AOSC) research project, Stephanie Hong, a second-year student, devised a more efficient method to analyze mutations in cutaneous T-cell lymphoma (CTCL) cells. Hong, along with her mentor Jaehyuk Choi, MD, PhD, the Ruth K. Freinkel, MD, Research Professor and assistant professor of Dermatology and of Biochemistry and Molecular Genetics, developed a workflow for single-cell RNA sequencing in CTCL cells. 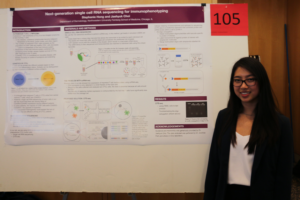 Stephanie Hong, a second-year student, devised a more efficient method to analyze mutations in cutaneous T-cell lymphoma (CTCL) cells. 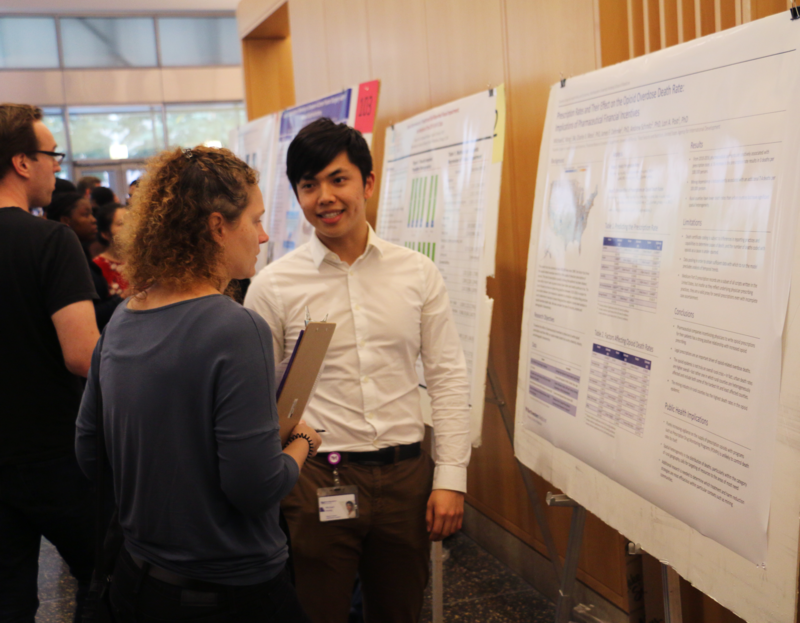 Hong, along with over one hundred other second-year students, presented ongoing results from their AOSC projects in a poster session held October 5. 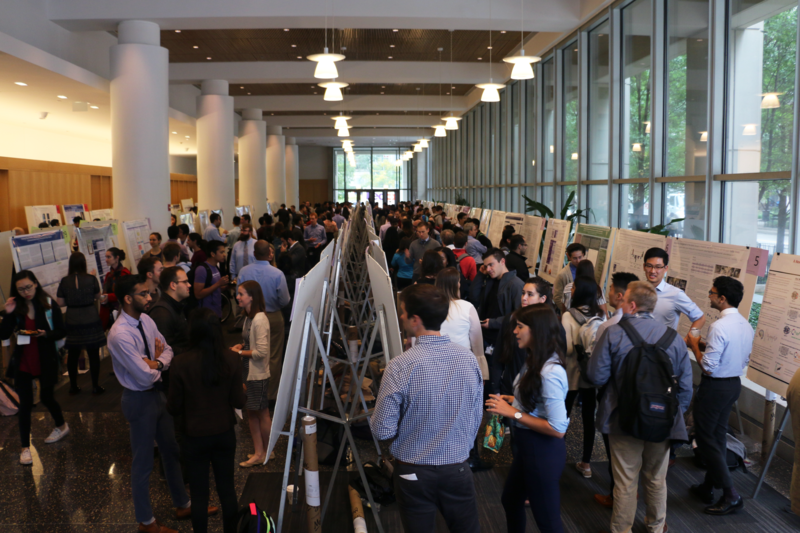 The AOSC is a four-year longitudinal investigation that culminates with students writing a thesis before they graduate, an experience that gives students first-hand experience with academic science and helps them develop relationships with mentors, faculty and other members of the Northwestern scientific community. Some projects had a broader focus examining public health issues, which have the potential to affect communities across the country. When Michael Wang, a second-year student, set out to investigate the relationship between pharmaceutical financial incentives and opioid overdoses from county to county, he expected to find a higher rate of overdoses in rural counties — after all, the opioid crisis is considered to be a rural epidemic, Wang said. “A lot of commenters describe it that way, largely because there’s a hotspot of deaths in rural West Virginia, Ohio and Kentucky,” Wang said. However, when examining the county-level data, Wang discovered that the rural overdose rate was actually smaller than the urban overdose rate, with the exception of that one afflicted region. Michael Wang, a second-year student, explains his project examining the relationship between pharmaceutical financial incentives and opioid overdoses. Wang’s project was overseen by Lori Post, PhD, the Buehler Professor of Geriatric Medicine, director of the Buehler Center for Health Policy and Economics at the Institute for Public Health and Medicine (IPHAM) and a professor of Emergency Medicine and of Medical Social Sciences. In addition to the revelation about urban versus rural death rates, Wang also found a positive correlation between the number of physicians or other entities receiving payment from pharmaceutical companies and the rate of opioid prescriptions in a county. 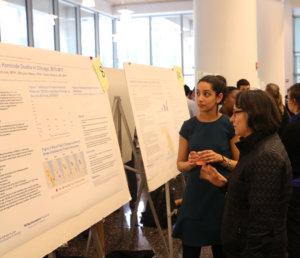 Other AOSC posters examined local issues, such as Simran Chadha’s investigation of gun violence among 15- to 18-year-olds in Chicago, measuring death rates among a variety of ethnic and geographic populations. Simran Chadha measured rates of deaths by gun violence in 15- to 18-year-olds, in a variety of ethnic and geographic populations in Chicago. Chadha, mentored by Karen Sheehan, MD, MPH, professor of Pediatrics in the Division of Emergency Medicine and of Preventive Medicine, also found a strict spatial restriction to much of this violence, occurring largely on the on the South and West Sides of Chicago. Next, Chadha wants to evaluate the effectiveness of certain public health interventions in Chicago, trying to determine where it’s working and where it’s falling short. “I’m definitely interested in public health as it related to pediatric populations, and this is a really impactful area of research,” Chadha said. Choi is also a member of the Robert H. Lurie Comprehensive Cancer Center.